Discover more about the main concepts related to homeostasis, from negative feedback to diabetes mellitus, and much much more on this topic. In a multicellular organism different parts of the body can perform different functions, and so some form of internal communication is needed to co-ordinate these different activities. The control system, (usually the brain), receives signals from internal and external receptors, responds to the signal and stimulates an effector to perform the appropriate action. The effector is usually a muscle or gland. Cells communicate either by electrical signals passed along nerve cells (neurones), or chemically using hormones. This is called cell signalling. Homeostasis keeps the internal conditions relatively constant, even when the environmental conditions change, or the organism’s behaviour changes, (by increasing physical activity for example). Homeostasis can be described in three stages, which can simply be described as sensing, processing and responding. A stimulus e.g. a change in temperature from a set ‘normal’ level is sensed by a receptor, either internal or external, and a nerve signal is then sent to the brain, which processes the information and the appropriate responses are put into action. The brain is not involved in some homeostatic mechanisms. 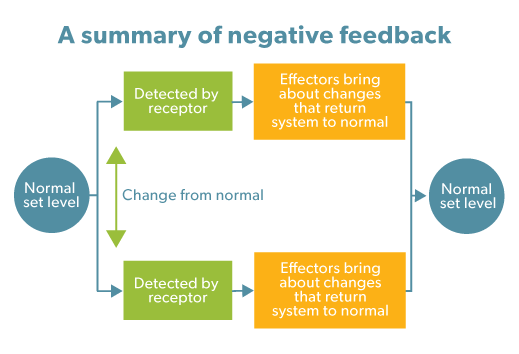 Negative feedback is the process in which a change from the normal ‘set level’ starts changes that will return it to its original level. With Reference to Specific Examples and Mechanisms Assess the Significance of Homeostasis to the Human Body. The mechanism of Negative feedback. Glucose molecules are needed to release energy to living cells during respiration. If the blood glucose levels are too low then the central nervous system (which includes the brain) will malfunction causing coma, and if uncorrected, death. If the levels rise too high then this can cause osmotic problems, resulting in cell dehydration. Glucose and water can be lost in the urine causing further problems. The concentration of glucose in the blood does not remain constant. After a meal the digested carbohydrates release glucose (and other monosaccharides) into the bloodstream. Increased activity of the organism increases the rate of respiration, especially in muscle cells, and will decrease the glucose concentration. Blood containing high glucose concentrations will pass through the pancreas in which there are small groups of cells called the Islets of Langerhans. These contain two different types of cells, the alpha cells (a cells) and the beta cells (b cells). The beta cells respond by secreting the hormone insulin into the bloodstream and the alpha cells respond by stopping the release of the hormone glucagon. The insulin reaches the cells of the body, especially muscle and liver cells, and binds to receptors in the cell surface. This causes an increased uptake of glucose from the bloodstream into the cells, (by causing more glucose transporter protein molecules to be moved from the cytoplasm into the plasma membrane), and the increased use of glucose in respiration. Insulin also activates enzymes, converting glucose into the polysaccharide glycogen (glycogenesis) , which is mostly stored in liver and muscle cells (and stops the reverse reaction). If blood glucose concentrations fall then the hormone glucagon is released from the alpha cells. This hormone activates enzymes in the liver, which convert the stored glycogen back to glucose (glycogenolysis). This raises the blood glucose concentration. Glucagon can also stimulate the conversion of lipids and amino acids into glucose (gluconeogenesis). This raises the blood glucose concentration. Glucagon can also stimulate the conversion of lipids and amino acids into glucose (gluconeogenesis). Type 1 diabetes (insulin-dependent) is caused by destruction of the beta cells in the pancreas. The cells are destroyed by a faulty immune response (an auto-immune response). Symptoms include weight loss, thirst, dehydration, lethargy, high blood glucose concentrations (hyperglycaemia) and glucose in the urine. A carefully controlled diet and regular insulin injections are needed. Type 2 diabetes (non- insulin dependent) occurs when the target cells in the body fail to respond to insulin. Symptoms are similar to those for type 1 diabetes but are usually milder. Treatment takes the form of a diet with controlled carbohydrate levels and sometimes medication. Enzymes need to be maintained at an optimum temperature if they are to work efficiently. Endothermic animals such as birds and mammals, can usually maintain their core temperature at an optimum level for enzyme activity. This allows them to be active in a wide range of environmental temperature conditions. Ectothermic animals, such as snakes and lizards, have a body temperature that fluctuates with the external environment. This means their activity can be reduced in cold conditions since their enzyme-driven reactions are working very slowly. Ectotherms can regulate their temperature by various behavioural and some physiological methods such as basking, moving from land to water, changing the colour of their skin and orientating their body with respect to the sun. If the temperature of the blood rises in a mammal, this can be detected by thermoreceptors in the thermoregulatory centre of the hypothalamus of the brain. This contains two control areas called the heat loss and the heat gain centres. The temperature being monitored is the core temperature, which should be around 37 degrees centigrade. As a result the heat loss centre sends nerve impulses to the arterioles in the skin and the sweat glands. The smooth muscles in the arterioles relax and this allows the arterioles to dilate ( vasodilation). This allows more blood to flow in vessels closer to the skin surface so that heat can be radiated away from the blood and conducted to the air. The skin surface may appear pink due to the dilated vessels. The sweat glands secrete sweat, which evaporates from the skin surface. The energy needed to change the liquid water in the sweat to water vapour (latent heat of vaporisation) is absorbed from the skin, which therefore cools down. Behavioural mechanisms can also reduce temperature such as removing clothes, moving into the shade, inactivity and eating less hot food. If the external temperature falls then peripheral thermoreceptors in the skin can give an early warning to the hypothalamus before the core temperature falls. The hypothalamus can send signals along motor neurones to cause certain groups of muscles to contract and relax rapidly in a response we call shivering. The contraction of the muscles needs the release of energy and this is supplied by respiration. During respiration heat energy is lost so shivering can supply heat energy to the muscles. Nerve impulses are also sent to the smooth muscles of the skin arterioles, causing them to constrict (vasoconstriction) This narrows the arteriole lumen and causes the blood to flow in capillaries further away from the skin surface, resulting in less heat loss by radiation and convection. Sweating will decrease and the erector muscles attached to the base of skin hairs will contract, pulling the hairs upwards. This does little to keep humans warm but in hairier mammals it traps a layer of insulating air and stops heat from being conducted away. Humans see this effect as ‘goose bumps’. Behavioural changes such as huddling, putting on extra layers of clothes and eating hot food and drink will also tend to raise falling core temperatures. In hot conditions a large amount of water is lost through sweating, as the body tries to cool the core temperature. If this is not replaced by drinking, the water content of the blood will fall and this can have serious consequences. The blood becomes more viscous and difficult to pump and the water potential of the tissue fluids becomes more negative. Osmoreceptors in the hypothalamus detect the fall in water concentration and cause Antidiuretic Hormone (ADH) to be released by the pituitary gland. This acts on the kidney, causing more water to be reabsorbed from the collecting duct into the bloodstream. ADH secretion is inhibited when the water concentration is returned to normal (negative feedback). If water concentration becomes too high then the kidney produces large amounts of dilute urine to return the concentration to the correct level. Homeostasis - Describe how temperature, blood sugar level and water are maintained in the body.